Article 1 : The Department of New and Developing Churches is a reserved office created by the Curia to work with the newborn and the smaller Aristotelian communities. - Article 1.1 : The Department is managed by a Roman Cardinal called Plenipotentiary Prelate. - Article 1.2 : The Curia gives special powers to the Department connected with its specific duties. - Article 1.3 : The Department cooperates with Congregations of the Holy Aristotelian Church concerning the matters and the realities connected with their proper fields and peculiar duties. to support the Churches with any difficulties and special needs. - Article 2.1 : The Department makes contact with the inhabitants of those countries where it is called for intervention. - Article 2.2 : The Department introduces them to the Aristotelian Church and Its Dogma. - Article 2.3 : The Department negotiates for the integration under the Aristotelian Church or the recognition as an Autonomous Aristotelian Church, according to the Canon Law. - Article 2.5 : The Department manages the Churches without Consistory and without an Episcopal Assembly. the Delegates, one for every Congregation, who have the task to maintain the links between the Department, their Congregation and the Legates. Article 4 : To become a Legate, a candidate have to apply directly to the Council. - Article 4.1 : The applicants must be clerics of the Aristotelian Church. - Article 4.2 : The applicants must be able to demonstrate a good knowledge of the Canon Law. - Article 4.3 : The applicants must have a degree in Roman Diplomacy and a degree in Theology. - Article 4.4 : The applicants must be multilingual (in addition to their mother tongue, they must be able to speak the lingua franca* and should have at least basic knowledge of the local languages). N.B. : English is here considered as lingua franca. Article 5 : The application must be expressed publicly at the Department of New and Developing Churches. Article 6 : Appointment is decided by the Council of the New and Developing Churches and the Plenipotentiary Prelate. Article 7 : The Plenipotentiary Prelate functions consist in dealing with every regions whose highest religious seat is vacant or never being settled, or supporting with ecclesiastical supervision into a region where the building of a clerical hierarchy is put in difficulty. 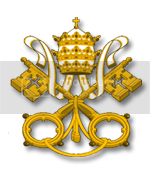 As the name indicates, he/she will have full powers and he/she will be in those regions the third most important figure of the Church : he/she is the ambassador of the Pope and the Church. The material cause = He/she is Roman Cardinal Elector. The efficient cause = He/she is appointed by the College of Cardinals or directly by the Pope. The formal cause = He/she is enthroned by the Camerlengo or the Archdeacon of Rome. The final cause = He/she represents New and Developing Churches. The material cause = They are cleric who had been a member of their Roman Congregation with an active experience* of more than 4 months, or the Chancellor of their Congregation. The efficient cause = They are appointed by the Chancellor of their Congregation and by the Plenipotentiary Prelate. The formal cause = They are enthroned by the Council of the New and Developing Churches. The final cause = They represent their congregation and they are called upon to coordinate and supervise the work of the Legates, in collaboration with the Plenipotentiary Prelate. N.B. : « active experience » means there are testified proofs and evidencies of his work inside the halls of the Congregation. The material cause = They are cleric who had been a member of a Roman Congregation with an active experience* of more than 4 months, or they are cleric interested on cooperating with the Department. They have a degree in Roman Diplomacy and a degree in Theology. The efficient cause = They are appointed by the Plenipotentiary Prelate. The formal cause = They are enthroned by the Plenipotentiary Prelate. The final cause = They are called upon to coordinate and supervise negotiations for integration of Aristotelian Church of the region under their responsability. Given at Rome under the pontificate of the Holy Father Eugene the Vth, the twenty eighth day of March in the year of grace MCDLV. Last modification and endorsement by the Sacred College of Cardinals on the first day of April, on Friday, in the year of grace MCDLXIV. Sealed and published by His Eminence Endymion d'Abbadie, Cardinal Vice-Chancellor, the second day of April, on Saturday, of the year of grace MCDLXIV, day of Saint Abysmo.